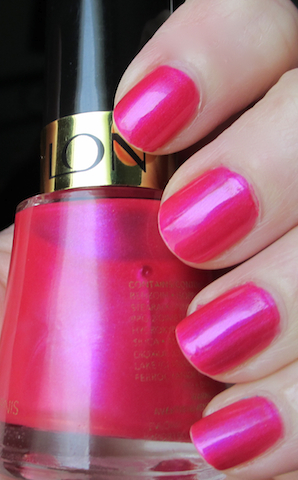 Revlon Strawberry Electric is a perfect name for it - it's a pink that looks like it's plugged in. It's almost neon magenta and it glows on the nails. I love the formula of Revlon polishes. The thinner consistency allows me to keep adding coats without it getting too thick and goopy. I have a bunch of other Revlon polishes for future posts and I have my eye on a few new ones. Posh, in particular - it's an awesome Kelly Green! OMG this colour started it all for me. I bought this 4 yrs ago bc i needed a pick-me-up during exams. it was all down hill from there. I rember getting it, putting it on then going back to school and getting compliments It was perfect. I wore it every day for like a month lol. I seriously need to bring this out again. I aso have posh,its great!